It is not often that we get to write about visitors to Cape Town. This week however we have a very strange visitor in the form of an ancient ship called the Borobudur. Although ancient in design the ship itself is not very old. It was built in the Kangean Islands about 60 miles north of Bali and took about 5 months to construct The design of the ship was taken from a stone relief found on the walls of the Borobudur temple. 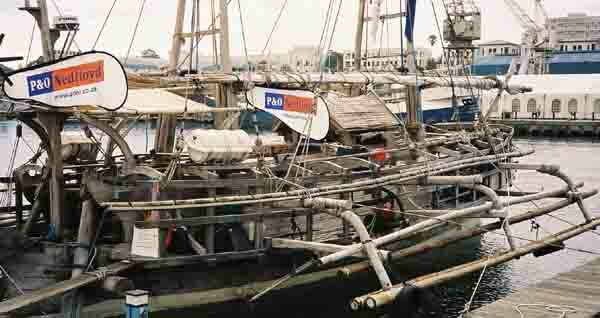 The ship is built of wood and has outriggers to keep it stable in rough weather. Its main method of propulsion is by sail although it does have a motor as well. The aim of the expedition is to recreate the ancient trading voyages between Africa and Indonesia and to prove that this type of ship was most likely the ship used in the ancient voyages. The ship Borobudur left the naval harbour in Jakarta at 23.00 hrs gmt on the 16th of August 2003. It sailed from Jakarta to the Seychelles and then south around Madagascar to Durban, Port Elizabeth and Mossel Bay where it stayed for Christmas. After leaving Mossel Bay the ship ran into some heavy seas and gale force winds which forced the crew to take down the mainsail and utilise the stormsail along the Cape coastline. Eventually on the 5th of January 2006 they rounded Cape Point and started to sail up the west coast of the Peninsula. Unfortunately for them the wind changed during the night and as the ship had a broken propeller they were unable to make headway necessitating them to call in the National Sea Rescue Institute to tow them into Cape Town harbour. 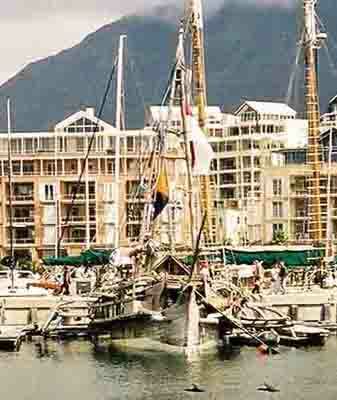 The ship will stay in Cape Town for about a week before setting sail for Ghana, a journey of 3200 miles up the west coast of Africa. The plan is to leave Cape Town around the 11th January 2007 and have their arrival in Ghana for between 15th to 22nd February if all goes according to plan. For those of you who would like to find out more about this very interesting ship here is their website address. I am happy to report that this ship sailed from Cape Town and reached its final destination in Ghana. 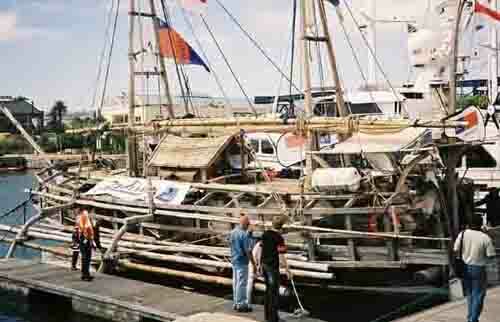 The owners of the ship are going to ship the ship back to Jakarta where it will be placed in a museum.